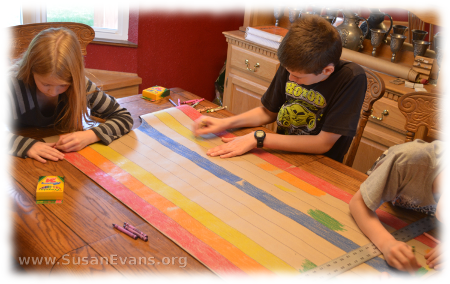 Joseph’s coat of many colors can be made easily with a large roll of paper and some crayons. You will also need scissors, a black marker, a ruler, and a stapler. I used a roll of brown packing paper, which you can find at office supply stores for around $5, but you can also use teacher’s bulletin board paper found at teacher supply stores. End rolls from newspapers are too thin for this project, tearing too easily. Check the height of the child who will be wearing this coat of many colors. Hold the paper up to his body, and cut it to whatever length you want. Fold the strip of paper in half before cutting. Then cut a hole at the top for the head. 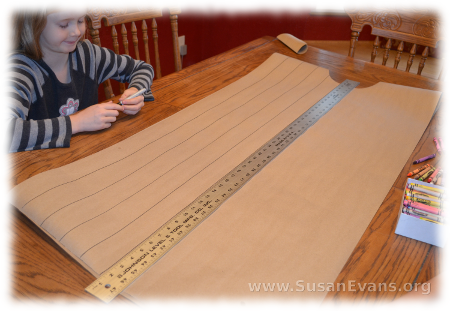 Grab a black marker and a long ruler, and draw stripes down the tunic. Have the kids color the stripes in different colors of the rainbow. Have the child put Joseph’s coat of many colors over his head. He should hold his hands to his sides while you staple down the sides. Now smash the top of the tunic, putting the child’s arms down, wrinkling the top so that Joseph doesn’t have to look like a scarecrow. Joseph’s coat of many colors is now complete. Every time I read the story of Joseph in the last 13 chapters of Genesis, I get choked up because Joseph forgave his brothers for the horrendous suffering he had to endure for years because of their actions. His brothers had wanted to murder him. Just let that sink in. Imagine living in a house where people wanted to murder you. They had so much hatred because their father gave Joseph a coat of many colors, showing his favoritism. His brothers decided to make themselves some money, so they sold him as a slave instead of murdering him. They lied to his father, allowing his father to scream in anguish at the death of his son. Years later, after working as a slave, being falsely accused and thrown into prison, and then rotting there for years, he was finally given a position of power in the government because he was able to interpret Pharaoh’s dream. He knew that there would be a 7-year famine in the land after 7 years of abundance, so he stored up grain. His brothers came to Egypt because of the famine, only to find the one that they had injured now had the power of life and death over them! (The dream that Joseph had about his brothers bowing down to him came true!) But he chose to forgive them instead, telling them what they intended for evil, God intended for good. 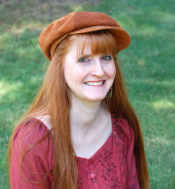 I just love this story of forgiveness! 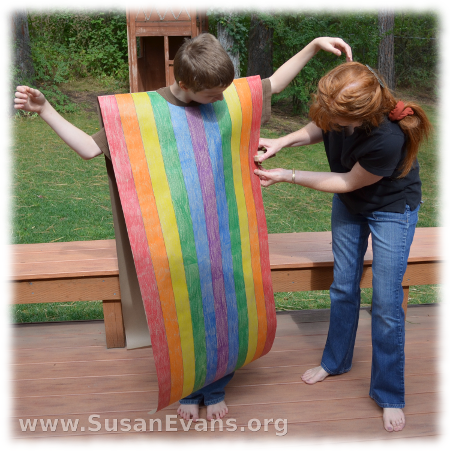 If you enjoyed this Bible lesson on Joseph’s coat of many colors, you will love Using Simple Costumes and Props to Teach the Bible. You receive this 2-hour video for free when you sign up for the Unit Study Treasure Vault, which has an enormous Bible section that you will love! This entry was posted on Tuesday, October 8th, 2013 at 8:00 am	and is filed under Bible. You can follow any responses to this entry through the RSS 2.0 feed. You can skip to the end and leave a response. Pinging is currently not allowed. Susan, fabulous job! First let me say that you had my interest right from the start. I love crafts and could easily envision trying this project with my children. I am also glad to have landed on your page because of the visuals, I will always remember this story!! This craft is super easy to make and is great fun. You can also cut it down the front to make it easier to put on, like a coat. Very nice work, and it’s always fun to have the kids involved in storytelling. Yes, when children retell the story, they really internalize it. This would also work using a yardage of fabric/ an old sheet. You can still use crayons to color the fabric. Then heat set with an iron making sure to stack newspapers between the fabric & iron and again between the surface & fabric. And obviously, you could just start out with colored fabric to eliminate the coloring process altogether.